At around 10 a.m. on October 12, 1957, a middle-aged man with strong-willed features was walking quickly to his place of work in a building located at 8 Karlplatz in Munich. He must have been in quite a hurry, because he didn’t notice a stranger with a folded newspaper waiting for him in the entryway to the building. As the man drew level with the unfamiliar gentleman, the stranger darted forward with a jerk, causing the unsuspecting man to stagger and collapse. Doctors and police who arrived on the scene established the cause of death as “heart paralysis.” The stranger vanished without a trace. 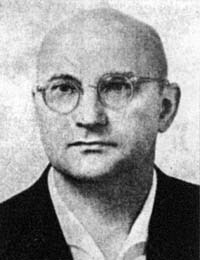 The deceased, or rather murdered, man was 45 year-old Lev Rebet, one of the most outstanding political leaders of the Ukrainian national movement in the 1940s and 50s, professor of the Ukrainian Free University (Munich), editor of the weekly Ukrayinsky Samostiynyk [The Ukrainian Independent], chairman of the OUN Political Council (abroad), a celebrated journalist, political scientist, and historiosopher. It was subsequently revealed that he had been murdered. His assassin, a veteran agent of the Soviet special services Bohdan Stashynsky, aimed a pistol wrapped in newspaper, which was loaded with potassium cyanide capsules, into Rebet’s face and pulled the trigger. Two years later, on October 15, 1959, Stashynsky stalked Stepan Bandera in Munich and killed him the same way. Explaining what motivated him to kill Rebet, Stashynsky told a court years later that he had discovered that Rebet was “the leading theorist of the Ukrainians in exile,” since “in his newspapers (Suchasna Ukrayina [Contemporary Ukraine], Chas [Time], and Ukrayinska Trybuna [Ukrainian Tribune] — Author) he not so much provided accounts of daily events as developed primarily ideological issues.” This explains why the Soviet special services resorted to liquidating Professor Rebet. We find more answers in his biography and the ideas that he developed and championed. Let us begin with an overview of his life. This was Lev Rebet’s lifelong goal. Like thousands of his contemporaries, participants of the national movement, Rebet had hungered for action since his youth, and was not content only to speak beautiful but abstract words about freedom. Lev joined the OUN almost immediately after its creation in 1929. The Polish occupational forces accused Rebet of being an OUN member and jailed him. His organizational skills and dedication to the national cause were duly appreciated by the OUN leadership: between 1934 and 1938 Rebet served as the leader of the OUN Territorial Executive in Western Ukraine. Characteristically, after the OUN split in 1940, Rebet sided with Stepan Bandera and not Andriy Melnyk. When the restoration of an independent Ukrainian state was proclaimed on June 30, 1941 in Lviv, Lev Rebet was appointed Deputy Chairman of the Ukrainian State Government headed by Yaroslav Stetsko. After Stetsko was arrested, Rebet temporarily served as Prime Minister of the government. Later he was arrested by the Gestapo and imprisoned in Auschwitz until the fall of 1944. Between 1945 and 1948 Rebet served as chief justice of the External Units of the OUN. At this time he moved to Munich. From 1948 he was one of the leaders of the OUN Political Council (abroad) together with Mykola Lebed, Ivan Butkovsky, and Myroslav Prokop, and soon became its chairman. In his final years, from 1954 to 1957, Rebet was a professor at the Ukrainian Free University. This article will not discuss the political aspect of Rebet’s activity, in particular his complex relationship with Stepan Bandera, which is a subject for a separate, long discussion. Instead we will focus on his studies on the theory and history of the Ukrainian nation, such as The Theory of the Nation (1955), Formation of the Ukrainian Nation (1951-1957), and Light and Shadows of the OUN (a book of historical memoirs, 1955-1956). Rebet’s ideas dating back fifty years have not lost their validity and justly deserve greater attention. The goal that he pursued in all these studies is both simple and extremely complex: to discover the meaning of the nation as a general phenomenon, and to uncover the meaning of the Ukrainian nation, its historical process of formation and development, and its future prospects. Obviously, the Soviet secret services considered such ideas to be extremely dangerous for the indestructible USSR. Hence the order was given to kill Rebet (it has not been ruled out that the facts that would substantiate this are still buried in archives). Although the Soviets succeeded in killing an outstanding politician and scholar (who was also a doctor of law), his ideas live on. We are now witnessing a democratic rebirth of the nation that would have been impossible without such figures as Lev Rebet.